Does Gardening Increase Fruit and Vegetable Intake? Do gardeners eat more fruits and vegetables than their counterparts? The research says, “Yes!” but notes certain types of gardeners consume more than others. This research was very intriguing to me, and so I took a look at the original article to learn more. As a blogger attempting to summarize key points from this study, Brinkman’s post is a fairly accurate portrayal of the original research. However, Brinkman does not clarify what kinds of gardeners appear to benefit most from gardening. The researcher’s results showed the 56% of community gardeners met the national recommendations of five or more servings of fruits and vegetables per day, but – contrary to Brinkman’s post – less than 50% of home gardeners met this mark. Only 37% of home gardeners and 25% of nongardeners reported consuming the recommended five or more servings. Scholars Fineburg and Rowe write in their commentary how those of us who relay information to the public can ensure we effectively communicate the story. Whether we are bloggers or university researchers, our role as conveyors of health information must be exercised with caution to ensure information is accurate and accessible to the audience. One of the guidelines Fineburg and Rowe suggest all messengers follow is to avoid simplifying the facts. In this case, blogger Brinkman has shared that gardeners consume more fruits and vegetables, but she fails to note what kind of gardeners are benefitting most: those who are growing in community plots. 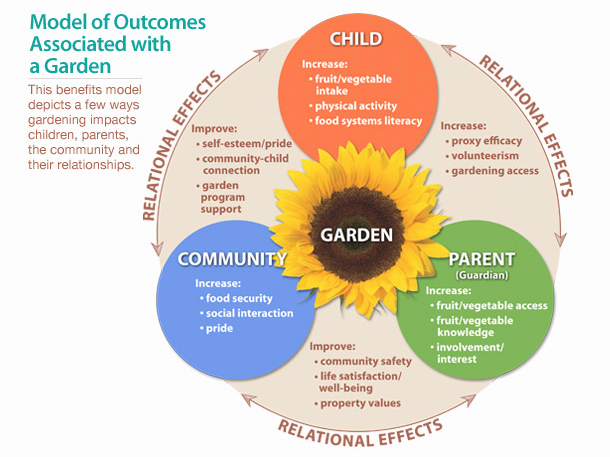 Also consider the context of this study: because this study was conducted among urban adults, we cannot yet say what role the community garden may have for children, or how health habits may differ for those in rural communities. So what should we take away from this study? While continued research will need to affirm these findings, this study shows that, while gardening in any form is associated with eating more fruits and veggies, our dietary habits might be more positively influenced through the connections we build within our communities. Find a neighbor and get digging! It’s still prime-time for skiing and plow trucks in the Northeast, but community garden plans are in full swing. Friends of Burlington Gardens (FBG) has been preparing for one of their youth gardening programs, and, after last weekend’s seed swap, many leftover seeds are available for the program to choose from. I spent close to two hours rummaging through these seeds and reorganizing them, and only made it through about one-third of the seeds! So what are the best things to plant in a youth teaching garden? Any time I have planted a garden, my choices have been dictated by availability and impulse: my gardens were filled with whatever excess starters I received from farmer friends or the contents of seed packets with the most attractive illustrations. This can work just fine until I end up with a field of overgrown mizuna greens or baseball bat zucchinis. Luckily, FBG is directed by wiser planners than me, who are more thoughtful about seed and starter selection. The grocery list of seeds for their youth program range from potatoes and onions and radishes to ground cherries and beets and various salad greens. Perhaps what’s more interesting, however, is what the youth garden will not plant. No watermelons. No pumpkins. No corn. Why? It’s largely due to theft. The youth garden is planted on a large, two-acre plot proximal to low-income neighborhoods, and past experiences have shown these foods are most frequently stolen from the garden. 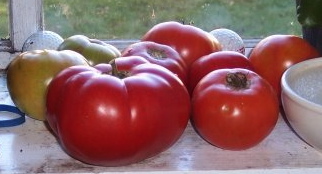 While FBG have stopped planting some crops, they have gotten clever about others: while bright-red, vine-ripened tomatoes are an attractive and easy-to-spot steal, green zebra tomatoes are much less likely to be taken since it is more difficult to determine peak harvest time of this deceptively green-when-ripe fruit. This is just one example of the tactics that will be employed by the coordinators of the youth program to prevent food vandalism by hungry neighbors. Certainly, these actions could be questioned morally. Should we be preventing the hungry from harvesting nutritious food they may not be able to afford? Can’t we just feed everyone with this garden? I respect the perspective of the clever coordinator who has resorted to planting green tomatoes: “I can’t solve hunger…we’re not big enough.” FBG offers an amazing service to the community by teaching youth gardening practices and providing food for underserved teens and their families. Much of the food is also sold by these entrepreneurial teens, who bring their product to farmer’s markets. Profits support the program and wages for the teens. It might feel contradictory to some to prevent the hungry neighboring community from harvesting the garden. I welcome your comments on this. As I see it, the priority of this program is to teach the youth job and life skills through their involvement in all aspects of farming, up through harvesting. Following this experience, I hope to see these youth return to area gardens and farms to help feed – and, better yet, teach – their hungry neighbors. Do School Gardeners Eat Their Fruits and Vegetables? 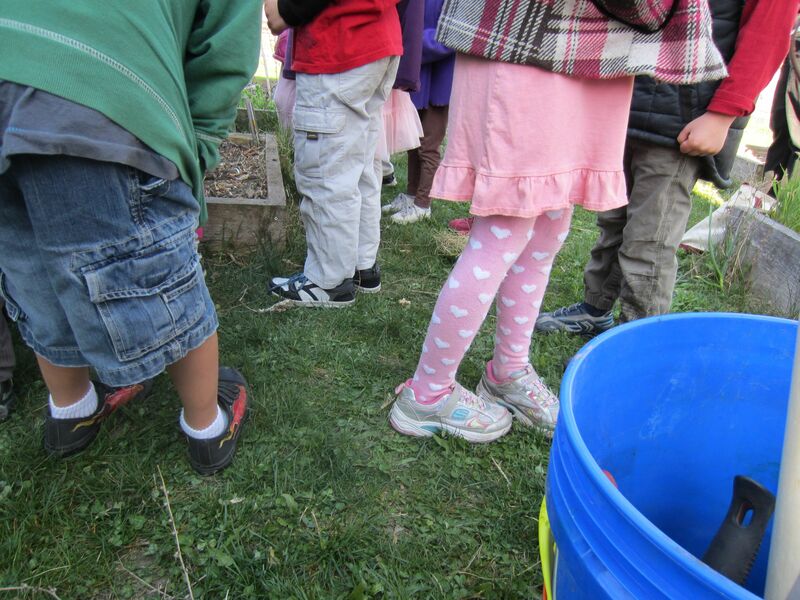 School gardens are a wonderful asset for teaching our youth. They get kids outside. Kids learn about nature and science. And then those kids try the plants they grow, eating their fruits and vegetables. Hold 0n – I have to agree that I have nodded my head along with everyone else when I hear about a school garden and its success with the youngsters. But how are we all so sure gardens actually change dietary habits? But is this always the case with school gardens? Does getting kids in the dirt actually result in their willingness to try new foods? Last spring, I worked with an after school cooking club at a middle school in Charlottesville, Virginia. The cooking club made different dishes each week which frequently included herbs or produce from the school’s teaching garden. One week, I planned a salad recipe for the students to create, and our first task was to gather some greens from the teaching garden. Because the cooking club is coordinated by the same teachers and community members who assist with the teaching garden programs, there is a large emphasis on using the garden’s produce within recipes, and there are also several students who are members of both the cooking and the garden club. On the week that we made a chef’s salad, I urged the students to try baby mustard greens to see if they thought it would be a good addition to their salad. Not all of the kids were willing to try the bitter, spicy leaf, including some who were also m embers of the teaching garden. So how can we be sure the exposure actually results in better diets?